It was love at first sight for Miriam when she first experimented with coding in the architecture office where she worked. Seeing an opportunity to apply her design skills and perspective in a new way, Miriam continued to embrace her interest in her free time. Eventually she found the courage to quit her job as an architect and dedicate herself to studying web design and development full-time. Just before committing to a university computer science course, Miriam came across Treehouse and decided to take the e-learning path instead. Over the upcoming months she dedicated her time to learning and working on small side projects to apply her skills. Once Miriam built up enough confidence, she decided to apply for a job interview. 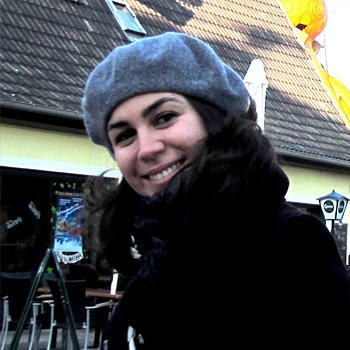 Miriam got the job and is now working full time as a web developer for a media agency in Frankfurt. She also still spends her free time learning and expanding her skills on Treehouse. I worked for some years in an architecture office in Amsterdam. During that time we had to update our website very often with new projects, events and news. We worked together with a freelancer, who was in charge of maintaining the site, but there were moments in which the changes to be done were so tiny that we ended up taking care of them by ourselves. I bought some books at that time, such as "How to Build a Website" or "HTML from A to Z" but they did not catch my attention and I forgot about the whole thing for a while. The e-learning approach wasn't as popular back then. I worked in a couple more architecture offices after that one in Amsterdam but my interest on the web design industry was always there. It was last year just before summer when I collected the courage to quit my job as an architect and went full-time to study web design and development. The first weeks unemployed were not easy at all. I didn't have a clear path to follow and I had a lot of questions about which way would be the best one to take. I even ended up considering going back to university and follow a computer science career. I started to fill in the application documents! I am so glad now that I did not do it. Treehouse was a huge source of motivation and inspiration, and I will always be very grateful to the team for that. At the same time I was looking for resources online and that's how I found Treehouse! I did not know anyone who have done that, switching careers by going online and spending some time learning by yourself. Honestly I had my doubts about it at that point. At Treehouse I followed mainly two tracks: Web Design and PHP Development. I personally learned a lot with the e-commerce store project “Shirts 4 Mike”. I found the tests and exercises to be very helpful and helped me a lot in my learning experience by consolidating my knowledge. I also enjoyed a lot the Treehouse Show every Tuesday and watched some of the conferences from time to time. I personally needed to check out what was going on in the industry, specially when I had doubts about being learning the right thing. I also followed some of the videos about becoming a freelancer at Treehouse and applied the Pomodoro technique during my studies at home. I definitely needed some help to organise my day-to-day and track my progress on a regular basis to keep the big picture in place. I was spending a lot of hours (normally between 7-9 hours per day), shared between Treehouse courses, reading documentation and trying to develop my own small projects, based on what I was learning every day. That last part was very important, since I soon realized that it was something totally different understanding everything clearly when you follow a course and knowing how to apply those concepts when you build something by yourself. Last November I had the opportunity of starting a project for a friend. The project is still in progress but I managed to build something good enough to take to a job interview. At the beginning of this year I started working as a web developer in a media agency in Frankfurt (Germany). It´s being a great experience and I am learning a lot every single day. I still try to spend as much time as possible learning online every week, although I can't do it as much as I wished.